Basically this is done in 9 steps. First, you'll need to tell the system the file name you wish to upload. Stitchboard members can upload a variety of format files (as can non-members, although non-members are more limited), including .gif, .jpg, .jpeg, .png, and .wbmp. The latter is not to be confused with .bmp. The .wbmp is a special portable image type. More image formats will be coming. To enter a file depends on your particular browser. Some browsers will let you click in the file box and type in a name. In these browsers, you can also click on the Browse button and locate the file on your drive. Other browsers will always open a disk browser window, where you will locate your desired file and click Open. In this area, you will select the stitching category in which you wish to create a pattern. Currently your options are Beading, Crochet, Cross Stitch, and Knitting. (Please note that when it comes to the finished pattern, should you decide to list it for free download or for sale, in many cases, selecting Crochet will create a pattern that will be listed under Crochet and Knitting in searches. A pattern created in Crochet Filet stitch will only be listed under Crochet. And vice-versa; creating a knitting pattern will also create a pattern that will be searchable under knitting and crochet. ) Don't panic if, as you make selections on the screen, you see other options change. This is normal, in an attempt to be sure all options for a particular stitch category and type are compatible. For example, when Beading is selected, area 3 (Select Your Stitch Type) only shows beading stitches. If you click on the Crochet category, area 3 will change to only crochet stitch types. In this area, you will select the type of stitch desired. For example, if you have selected the Beading category, you will be able to select Loom, Square, Brick, and Peyote stitches. Stitchboard members will also be able to select Right-Angle-Weave (RAW), and Herringbone. Again, as you make a selection, you may see other options change. Speaking of the devil, in the case of Beading, here's where you'll select the type of bead, and thus the stitch shape. RAW and Herringbone stitches will only allow oval (seed beads), while the other beading stitch types will allow both oval and rectangle. For Crochet, Cross Stitch, and Knitting, there is currently only a standard stitch shape (rectangular or square). Now is when the fun starts. This section allows you to specify all sorts of things about the colors you want. Section "a" allows you to select the manufacturer's palette you want. The palettes vary depending on the stitch category. For Beading, you can select Miyuki Delica, Miyuki Seed, and Our Palette (which is actually a modified version of DMC colors). For Crochet and Knitting, your options are DMC, Anchor, and Our Palette. For Cross Stitch, the palettes available are DMC, Anchor, and Madeira. More palettes will be coming in the future. 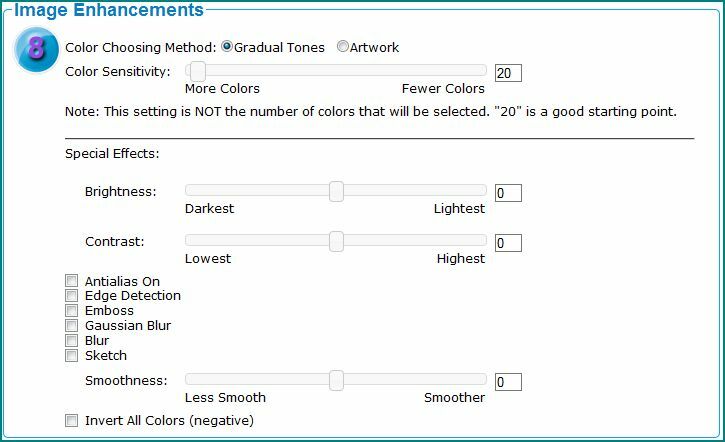 Section "b" allows you to choose either an automatic color selection mode, or whether you want to manually select your desired colors from the given color palette in section "a". The default is to have the system attempt to locate the closest colors to what's in the image or drawing that you upload. If you click on the "I will choose my colors" option, you will see the entire palette that you selected in section "a". Generally, these are sorted by the manufacturer's color number. If you point to a particular colored box, the manufacturer's color name will pop up. This way you can be doubly sure that the color number and name match what you want. To select a particular color, simply click in the small checkbox and a small check mark will appear in the box. There is also a color count at the top and bottom of the color display, which will let you know how many colors you currently have selected. Currently we have set the maximum number of manually selected colors at 30. If you try to select a 31st color, the system will complain and remove the check mark. You should select at least 2 colors and no more than 30. If you have opened the manual color palette and wish to close it and go back to automatic, simply click back on the "Automatic closest color match" button and the palette will close. Also, if you have an open color palette and wish to select a different one, simply go back to the pull-down menu box and choose a different palette name. The new open color palette will change to the new one. For example, if you select DMC and manual color selection, you will see the DMC palette of colors. Now if you go back and drop down the menu and change the palette to Anchor, the DMC palette on the screen will change to Anchor. Neat, huh? One note about the colors on the screen: The colors on the screen are as close to manufacturer's actual color that we could create, but there's no guarantee that they're exact. For your protection and ours, "The colors on the screen are for reference only and to be absolutely certain, you're best either doing your final match at a store, or by obtaining an actual color sampler. " Entire Palette: The computer will match colors using the entire palette of colors. Keep in mind that by using this option, you may be matching between 800 or 900 colors so you may get a lot of colors in your final pattern, and many may look similar. Limit The Number of Colors: You can limit the number of colors the computer selects from the given palette. When you select this option, another box opens that lets you specify the number of allowed colors. So if you entered 10 colors, your final pattern will have 10 colors. Again, the computer will do its best to select the 10 closest matches. If you select too few colors, the colors it selects may not be great. Too many colors may give you a confusing pattern. Shades of Gray: Select this if you want your pattern to be made up of only shades of gray, including black and white. Again, when you select this option, another box will open and allow you to enter the number of shades desired. There are a limited number of shades of gray (this is defined by manufacturer, not by Stitchboard! ), so too large a number will not get you more colors. Black and White: This will give you a black and white pattern. Don't panic if you don't like everything the way it draws it out. There are other options in section 8 that can make things better. This is where you enter the number of stitches across that you want your pattern to be. Stitchboard members can create a pattern up to 150 stitches across. Non-members are limited to 100 stitches. The number of rows will be automatically calculated to keep your image proportional. So if your original image is 400x600 pixels and you enter 100 stitches, your final pattern would come up with 150 rows. There is a limit to the number of rows, but this is decided depending on the number of colors, stitch, stitch type and some other factors. The system will tell you if you go over the limit. HINT -- If the number of stitches across is not the same as the number of the original pixels across, there will be some dropping or adding of additional stitches in your final pattern. So for smaller images (150 pixels across or less), the optimal setting is the same number of stitches across. For example, if my original drawing is 100x120 pixels, the absolute best setting would be 100 stitches across. The resulting pattern would then come out 100 stitches, by 120 rows. For larger original images, it's often best to try various stitch counts to find a setting with minimal changes to the picture. Output: This option allows you to select either screen or .pdf output. The screen-generated pattern can also be printed and/or saved to disk. When selecting a .pdf output, you will also have additional options. First, you can select to get a .pdf with colors only. Or you can select symbols only. Or, you may want both colors and symbols. The other options you'll have are to add additional custom information on the cover sheet of your .pdf pattern. You can enter your pattern name, your company name, an optional email address, your web site url, suggested fabric, other notes, and an optional copyright notice. All of these items will print on your pattern's cover sheet. If you leave any of these items blank, the line will not show up on the cover sheet. Speaking of cover sheet, this page will be the first one shown in your .pdf file. At the top will be your pattern name. Then in a section below that will be your optional items we've just talked about. In the case of cross stitch, you'll also see the stitch counts, color count, and various sizes, depending on the fabric count. Below this information will be a small preview of your pattern. And below the preview will be a key of the symbols, sample swatches, the manufacturer color numbers, and descriptions. If there are more lines to the key than will fit on the cover sheet, the system may move the key onto a second page. If the key fits on the cover sheet and a second page, it will begin on the cover sheet and continue onto a second page. Speaking of cross stitch, on the .pdf output, the center marks will show as small triangles at the top and left of the center page. Every 5 and 10 Stitches: Places a darker grid line every 10 stitches, and a lighter grid line every 5 stitches. The Easy-Read option will be available for other stitches in the future. There is one other option in this section. You can enter a copyright notice if you would like ownership information printed right in to your pattern. It will appear near the bottom, between the pattern and the color swatches. We'll discuss the final output a bit later. Whew. Where do we begin? This option gives you abilities not available anywhere else! We'll go through the ones available right now. (More coming in the future). The first two options are available to everyone - Stitchboard members and not. Color Choosing Method: There are currently two options, Gradual Tones and Artwork. "Gradual tones" is a good option for photographs that often have smooth transitions between colors. The "Artwork" option is good for originals that have a more defined transition between colors, like line drawings, cartoons, and other hand-drawn art. But, this is not cast in stone, so experiment! Some photos may look better with the Artwork setting. And some artwork may look better in the Gradual Tones setting. Go figure... You'll find that you can generate a pattern one way, click on an Edit button, make one or two setting changes and re-submit it to see if it comes out better or worse. As you spend time with it, you'll find settings that you like for certain types of images. This is part of the fun of our Pattern Wizard! Color Sensitivity: This is probably my favorite option of them all. Here you can set it so the system chooses more colors or less. The default is right in the middle. I find that if I'm getting 30 or 40 colors in the final pattern and want to cut the number down, by clicking on a button one number to the right, this may cut the number down to around 12-15 colors. I often find that the colors chosen in the final palette when changing this option slightly to the "fewer colors" side are often more accurate to the original. You can actually try different settings, cutting down the number of colors one notch at a time, until the colors in the pattern look bad, then reverting back one step. I have taken an original image that was creating a pattern with 93 colors, and by adjusting this option up a few notches, got it down to 10 colors with no noticeable color mismatches. So do experiment with this option! The rest of the Image Enhancement features are only available to Stitchboard members. And remember that membership is free! Antialias On: Check this box to enable antialiasing, which smooths edge transitions. If your original image has jagged lines, turning this on can smooth them out. Change Brightness: You can change the image brightness if desired. Your original image quality will determine whether this function needs to be changed. Change Contrast: Allows you to adjust the image contrast. Again, your original image quality will determine whether this function needs to be changed. Edge Detection: A function that attempts to detect lines within your image. Depending on your original image, this function can sometimes create an almost line-drawing look to your image. Many times, turning this option on will only give you a gray image with some lines in it. Again, feel free to experiment. Emboss: The emboss function attempts to create an "embossed" or "3-D" look to the image. As with the Edge Detection option, the results vary greatly, depending on your original image. Experiment! Gaussian Blur (also known as Gaussian smoothing): This function is often in photo software to reduce noise in an image. It is also used to slightly blur an image that's a half-tone (or made up of dots, like a newspaper photo). You may or may not notice any change when using this option. It depends on the original image and how you have some of the other enhancement features set. Blur: This option does a generic blurring of the image. It's relatively straightforward and the results will vary, depending on the original image. Sketch: Turning this option on has varying effects on your image. It seems to try to pull lines out of darker areas and make an image a bit more like it was hand-painted. Depending on your original, the resulting pattern may be interesting, or a bunch of strange starry things going on. Experiment with this in combination with other effects. Smooth: As the name implies, it smooths your original. Not! But it does do some interesting things to your image when you set it down near the bottom setting. I think the higher settings do a bit of smoothing of lines. All in all, just an interesting option. Invert All Colors: Here's an easy one to describe. It simply makes a negative out of your image. Black turns white. White turns black. Blue turns yellow. Etc. I found that using this in combination with a few of the other effects makes for some really interesting results. And for fun, there are more special effects coming. Step 9: Let's See It! Finally, click on this button to submit your settings and generate your pattern. Depending on the size of your original image, in a few seconds, you should get a pattern meeting your specifications. This is a starting point. Let's briefly discuss the results. Above the pattern are some buttons. Download Pattern: Clicking on this button will open up a window that will allow you to save the pattern just generated onto your disk drive. You can name it anything you want and place it anywhere on your drive that you desire. When done, the window will close. Change Setting: This button will begin the process all over. BUT, it will remember your previous settings so if you want to make any changes, you need only change those settings that you want. The rest will remain the same. We'll discuss this option in more detail shortly. Erase and Start Over: Click on this button to forget everything about your previous image, pattern, and settings and start over as if you just ran the program for the first time. Share This Pattern: This will be discussed later, but basically it allows you to upload the pattern you just created and allow others to see it and download it. When you click on this option, a window opens and you will enter a name, description and searching key words so others can find your pattern. Again, more about this later. Submit this Pattern to Sell: Again, this will be discussed later, but this option will allow you to upload the pattern just created into a special area that others can search on and purchase. More later. Print Pattern: Clicking on this button allows you to print the pattern you just created. When clicking on this button, a new window will open, as well as a print window. Assuming you've printed before with your computer, the operation is the same. After you press the "Ok" or "Print" button in your print window, your computer will print the pattern. You may need to change your print settings to either adjust the size or split it into multiple pages. After printing, the print and smaller pattern windows will automatically close and you'll be left once again at your pattern page. Note that this is not a screen print, but actually only prints the pattern, from just below the buttons to the number of colors and stitch count. So we've discussed the buttons above your new pattern. Just below the buttons will be the pattern. You'll notice several things about the pattern. There are stitch and row counts along the top, bottom, and sides. If you have selected a grid, you'll also see that. The pattern itself is pretty self-explanatory. If you've selected the Beading category, it'll show your pattern using ovals or rectangles, as you specified. 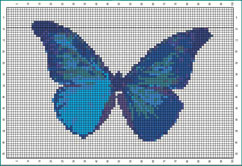 Other stitch categories will create similar patterns, but use rectangles or squares. In the case of an Easy-Read pattern, the stitches will be separated by spaces. Below the image portion of the pattern are swatches of the colors used within the pattern. You see both the colors and the manufacturer's color numbers. You also see the number of stitches that use this color. Below the color swatches and counts is your copyright notice, if you entered one. Three other pieces of information are below the color swatches. These are a shameless mention that our software generated this free pattern, and below that, the total number of colors used and total number of stitches in the pattern. Ok, so you've just created your pattern but want to see how it would look with slightly fewer colors. Simple. Click on the Change Setting button (which should be Change Setting(s) since you can make as many changes as you want on the next screen). After clicking on this button, you'll magically return to the original Pattern Wizard page; however, now you'll also see two thumbnail images of what you're working on. One thumbnail will be of the final pattern just generated. This is only a rough summary of the pattern you just created. There may be strange patterns showing up in the grid. Ignore this. It's caused by reducing a "lined" image, or image containing lines. If you've ever heard the term "moiré pattern", this is what causes the pattern thumbnail to often look different. And also, in fitting it to the little thumbnail window, the proportion may also be off. Again, don't worry about this either. This is only to give you an idea of what you're working on. To the right of the pattern thumbnail is a thumbnail of your original image. Assuming you don't want to change the original image file name and upload a new image, simply continue to steps 2-9, depending on what change(s) you want to make. If you DO want to change images, then enter the new file name in the box next to the two thumbnail images. Feel free to generate patterns for multiple stitch categories, too. So, for example, if you just created a pattern for beading and selected to share it with others in our free area (thank you very much! ), you can click on the "Change Setting" button, go to step 2 and click on Cross Stitch, go to the bottom and click on the "Let's See My Pattern" button, and, voila, now you have the same image in a cross stitch pattern. Go ahead and share that, too, if you'd like. You can now go to the Pattern Menu Page or, if you're ready to try your hands at creating your own pattern, you can go right to the Pattern Wizard.